CALGARY, Nov. 24, 2017 /CNW/ - WestJet today introduced WestJet Link, a new regional air service operating under a capacity purchase agreement (CPA) with Pacific Coastal Airlines. Book by December 4, 2017 (11:59 p.m. MT) for travel between March 7 & June 27, 2018. For Medicine Hat travel from May 31 – June 27, 2018. Blackout dates apply. Visit westjet.com/flight-schedules-new for more information. Book by November 24, 2017 (11:59 p.m. MT) for travel between March 7 & June 27, 2018. For Medicine Hat travel from May 31 – June 27, 2018. Blackout dates apply. Visit westjet.com/flight-schedules-new for more information. "A CPA with Pacific Coastal underscores WestJet's commitment to offering more Canadians access to WestJet's low fares and growing network. WestJet Link will be that connection to these communities and will offer more choice and more competition for air travellers, as well as more opportunities to earn and use WestJet Rewards." "All of us at Pacific Coastal Airlines are excited and proud to be entering this relationship with WestJet. Our two airlines, both based in Western Canada, share many similar corporate and guest service values and we feel that this CPA is a perfect partnership to link many new communities to the WestJet network." "This new partnership between WestJet and Pacific Coastal will allow smaller communities within Alberta and British Columbia to take advantage of YYC's extensive route network. Bringing in new passengers from these communities provides more opportunities to support additional long-haul destinations and contributes greatly to WestJet's growth strategy out of YYC." "Today's announcement represents a milestone that we've been striving towards for years. This partnership between two great companies, WestJet and Pacific Coastal Airlines, is a best case scenario allowing for the right-size aircraft, providing high frequency and timely connections to Calgary and WestJet's international network. In addition, we are pleased to announce we will reduce our Airport Improvement Fee in Cranbrook to four dollars for all flights booked on or after December 1, 2017, for travel on or after March 7, 2018. Welcome WestJet, you will soon see just how delighted we are to have you operating in the Kootenays." "This is very exciting news for the City of Cranbrook and surrounding communities. 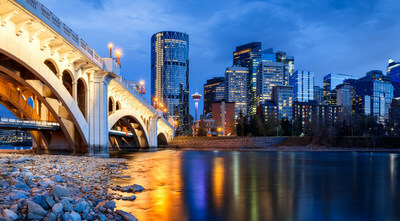 Residents from the East and West Kootenay have been waiting for years for WestJet connections to Calgary giving access to destinations around the world. This also opens up the world with easier access to the Kootenays. Pacific Coastal has been a great supporter of the Canadian Rockies International Airport and this solidifies their other routes with us. We will put concentrated effort into encouraging the public to take advantage of this added service." "Lethbridge County is pleased with WestJet's decision to serve the Lethbridge Airport beginning in March 2018. The daily flights to Calgary will provide additional and convenient access for business and leisure travellers, further solidifying the Airport as a thriving air service centre. Calgary is a hub for travel around the globe, and with flights to and from the Lethbridge Airport this service will provide Southern Alberta yet another opportunity to access a gateway to the world. As we work toward growing the Airport and its services, this announcement will help us to achieve that goal." "Today's announcement is very welcome news. Enhanced air service is something residents and the business community in Lethbridge have been requesting for a long time. Lethbridge is continuing to be noticed on a provincial and national scale for being a great place to live and do business, and enhanced air service was a previously missing piece of the puzzle." "The City of Lloydminster is elated to welcome WestJet to the Lloydminster region and we look forward to the many social and economic benefits linked to enhanced services at our municipal airport. In recent years, the City has invested in a number of modifications at our airport and we are confident WestJet will find our facility a comfortable and effective location from which to serve guests." "Having WestJet providing service from the Lloydminster Airport is a big win for our airport and our region. We have a fantastic staff operating and maintaining this facility and it has long been our shared vision to attract an internationally esteemed carrier such as WestJet." "We are excited to have WestJet offer direct service from Medicine Hat to Calgary. The City has been committed to increasing air service offerings to our residents, businesses and visitors. In our efforts to promote economic development and tourism, we've upgraded the airport terminal and apron and will continue to upgrade runways to make air travel more convenient and enjoyable." "We are very excited to have non-stop service between Prince George and Calgary again with service provided by WestJet and Pacific Coastal Airlines, both Prince George Airport partners. Calgary is the number one unserved market requested by the greater Prince George community." For further information: Media contacts: To contact WestJet media relations, please email media@westjet.com; To contact Pacific Coastal airlines, please email quentin.smith@pacificcoastal.com.